The police are offering a $100,000.00 reward for the arrest of Conor D’Monte from the UN for his alleged involvement in the murder of Kevin Leclair. AYFKM? Tax dollars? 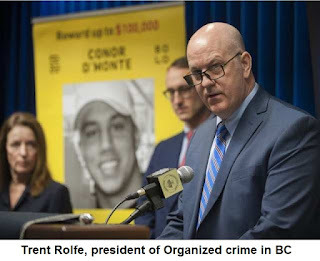 Kim Bolan is reporting that instead of saving lives by getting fentanyl off the street and disrupting street level drug trafficking, the compromised BC Gang Task Force has created yet another dramatic red herring to waste more tax dollars on unscrupulous criminals who lie for them in court. This new campaign is empirical evidence that Gang enforcement in BC is compromised. They are going to spend another small fortune on the same unscrupulous criminals that lied for them about Corey Vallee just so they can set someone else up for something he did not do. Ask yourself this, why are the rat pack so willing to testify against Conor D’Monte but are too afraid to testify against Billy Ly? Because they are lying about Conor D’Monte just like they lied about Corey Vallee. Corey was not the shooter. The shooter was much bigger than Corey. Anyone who saw the surveillance tape could see that. The compromised BC RCMP have no desire at all to charge the person who ordered the murder of Britney Irving. That is a closed file as far as they are concerned. They have a conviction and they don't even care about accomplices. In fact they would rather pay one of the accomplices to her murder an obscene amount of tax dollars to lie about rivals again. You cannot get any more corrupt than that. Blaze is still posting on my blog. I didn't blow his cover he did. He stopped for a while but as soon as I mentioned Billy Ly he started up again because that worthless piece of garbage can't keep his mouth shut. That makes him untrustworthy. He slowed down considerably after I outed him for posting on my blog when he's supposed to be in prison but he did not stop and yesterday he tried to post on my blog twice. I know when Blaze tries to post no mater what username he uses. If he promised his handler to stop he lied. Again. After the Surrey Six the Bacon brothers and the UN were at war. The Surrey Six murder started the conflict. What about going after Jarrod Bacon for the murder of Nicole Marie Alemy who was shot dead in Surrey while her toddler was in the car. Jarrod was involved with ordering that murder. It's time to move forward not backward. The BC Gang Task Force has done nothing to disrupt the Hells Angels drug trafficking in BC since the Kelowna Summer Jam in 2012. Since they refuse to confront organized crime we need to hire someone else who will. Did think it was a tad "odd" to be putting up a reward that large for his "capture". Left me wondering if they reward would still be paid if he was shot and killed by his enemies. The poster didn't say dead or alive, but it might as well have. If this person is arrested or not, drug dealing will continue. Better to spend the $100K on rehab or enforcing some of the laws. Of course it maybe those who issued the "reward" have their own agenda. You mention "the police" as offering the reward, is that the RCMP or is it the RCMP working for the provincial government. I know the RCMP have a 20 yr contract with the province so at one level they all work for the province. However, some work in cities and some more closely with provincial government bureacrats. Like who came up with this idea? A provincial government worker or an RCMP officer. Just wondering. It does make one think this could just be an ego thing, if its RCMP motivated, you know the mounties always get their "man". I'm not sure which department the money is coming from. We need a financial disclosure on how much was spent on these lying witnesses who got off of murder in Corey's case and how much has been spent on them since. Continuing to spend tax dollars on those clowns after they were proven to be lying is fraud.